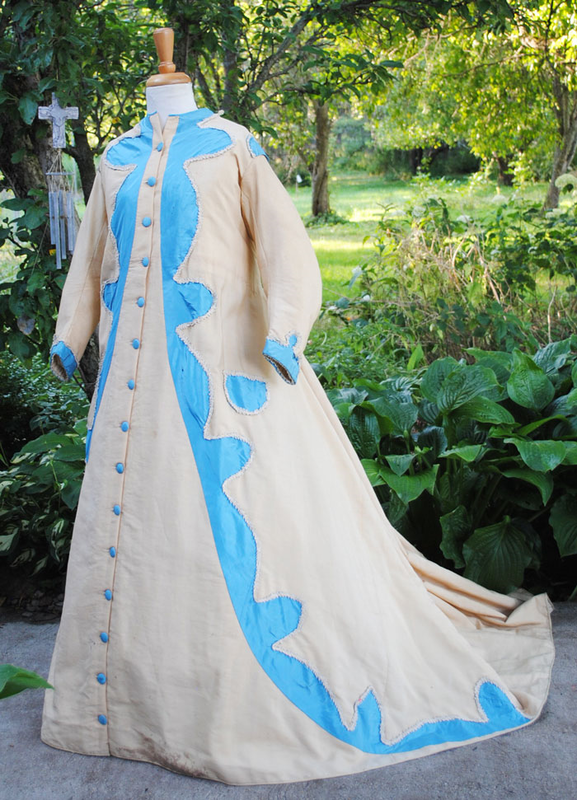 Offering an exceptional fetching Civil war era 1850- 1860's lady's dressing gown in ivory wool and cotton with blue silk insert trim, with white braided trim, machine sewn and hand sewn. 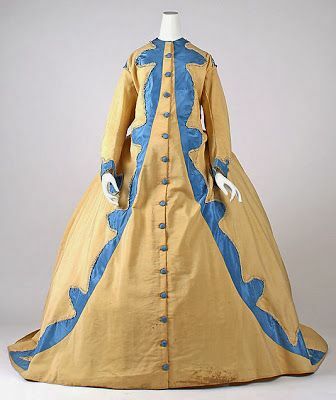 Recently de-accessioned from the Metropolitan Museum of Art in NYC. The bodice is piped at armscyes at drop shoulder. 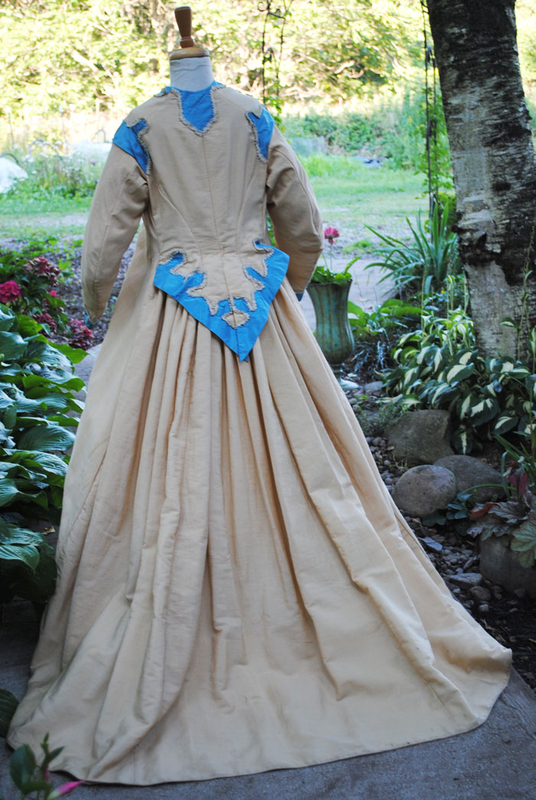 The gown is lined with ivory colored polished cotton in bodice and gauze in skirt. Gown has original fabric covered button closures in front, and one side pocket. 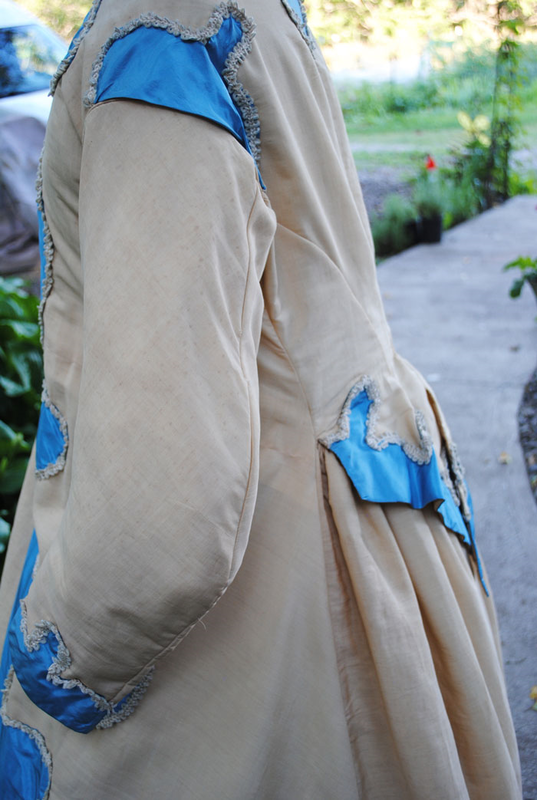 The long curved arm sleeves and flared at top and tapering to wrist. 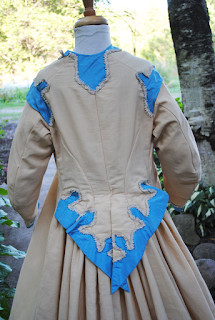 The back waistline is gathered with cartilage pleating hidden by a large back split peplum. 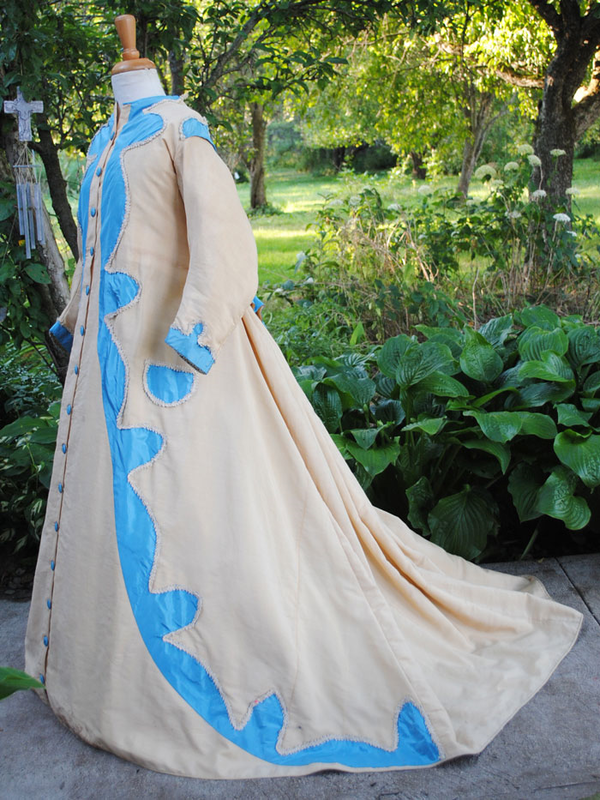 The gown is in fair to good study condition. There is underarm discoloration stains. Fringes are complete and not missing. 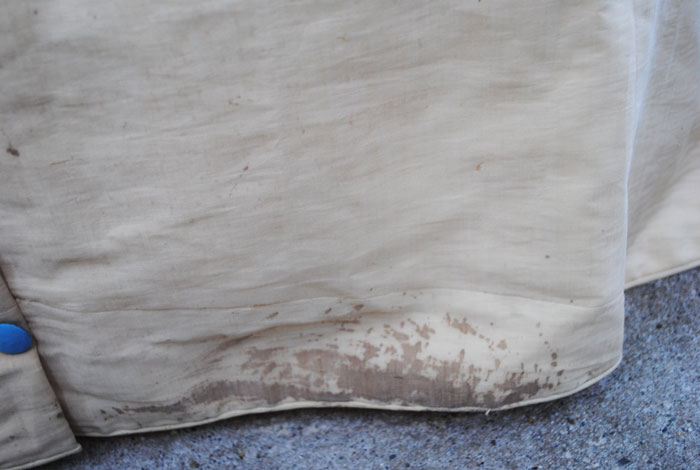 Discoloration staining on front on hem line as shown in photo. Scattered very small pin size dot oxidation spots all over. 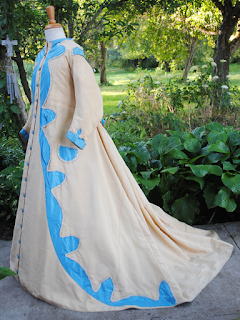 Few small holes in tan challis and in blue silk trim. 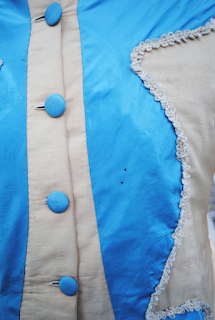 Few small brown spots on front blue silk trim. The fabric is rich and supple. Bust 38", Waist 38", Sleeve length 21", Length from shoulder to front hem 57", Length from shoulder to back train 69", Shoulders across back 15", Circumference at hem line 168-1/2". 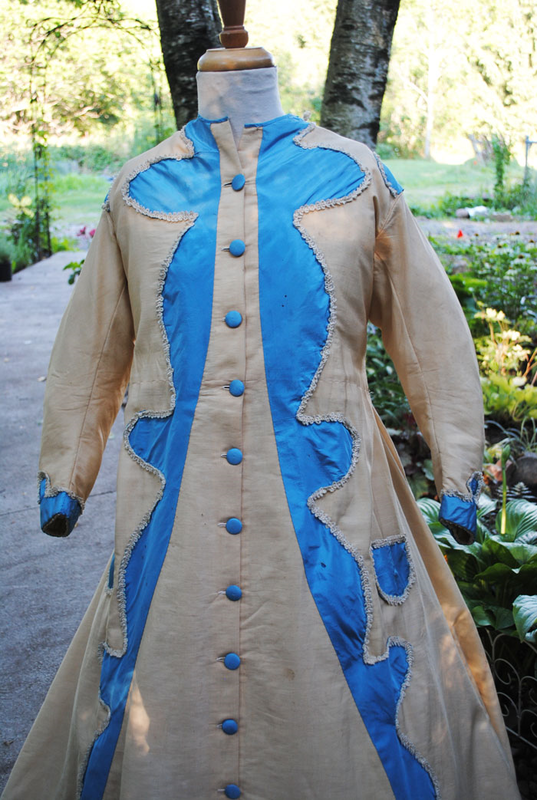 In fair to good, presentable condition and a great display gown for study or display. 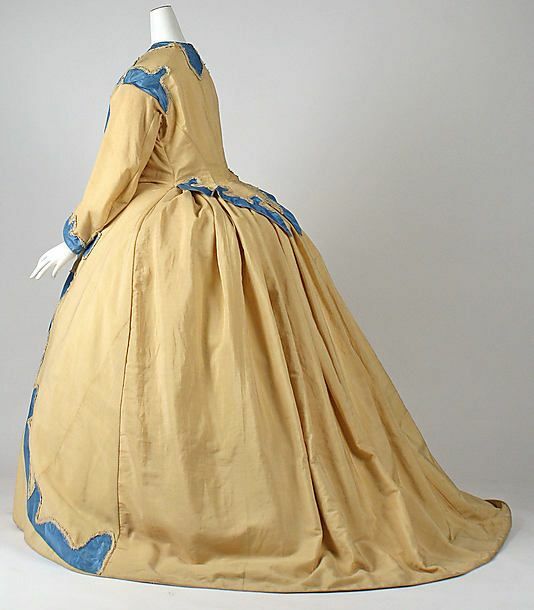 A beautiful display gown. A superb hard to come by dress of 160+ years of graceful life. 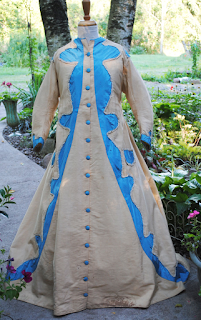 I think the extant one is later than the one above from a fashion mag circa 1863, but the similarities are pretty obvious: the design down the front, the shape of the sleeves, ect. 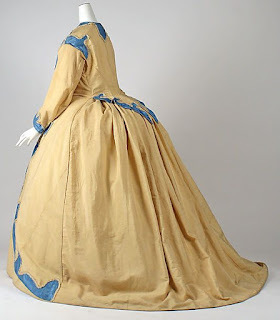 The only reason I think the extant one is later is the "tails" in the back which were more popular in the later 1860's/early 1870's. The above are the original photos from the MET...and the reason I think it's really a pale yellow rather than an ivory. Or else, it's faded a lot since it's been de-accessioned! Here is a lovely gown that was inspired by this extant one.